World War 2 was by its very definition a World War, engulfing the globe and having a cast of millions. While much of the course of it is well known, there are many aspects, units, episodes, and smaller engagements within it that I certainly have not learned about and I suspect others are similarly unaware. So I've decided to do an occasional post, and perhaps should interest be sufficient make it a regular thing on this blog on some of those lesser known episodes. So without further ado: Frenchmen Flyers in Russia! In 1943, at the suggestion of Charles De Gaulle, a group of French pilots was sent to assist the Russians on the Eastern Front. Groupe de Chasse 3 of the Free French Air Force was sent to the Soviet Union to fight the Nazis, and soon became the most decorated unit in the French Air Force. 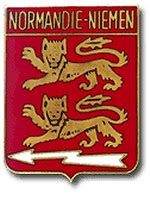 The unit was soon named the Normandie-Niemen Regiment, commemorating its contribution to the Battle of The Niemen River. 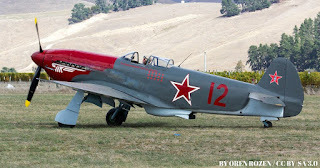 Initially flying the Yak-1 fighter that they used to good effect, and then transitioning to the superlative Yak-3 fighter, the Regiment racked up 273 enemy aircraft shot down, 37 probables, for a loss of 87 aircraft and 52 pilots. The Yak 3 out turn and out run the Germans' Bf-109 and FW 190 fighters. 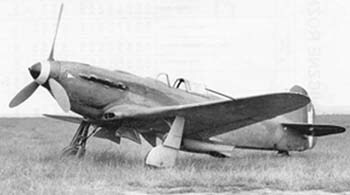 German pilots were warned not to engage a Yak-3 in a dogfight below 14,000 ft, as it could roll with the Focke-Wulf Fw-190, and its turn radius was superior. With an excellent plane the excellent pilots of Normandie-Niemen made their presence felt. Apparently the unit annoyed the Nazis so much that Field Marshall Keitel had issued an order that any French pilot captured on the eastern front would be executed rather than treated as a Prisoner of War. 4 of the French pilots were awarded the decoration of Hero of The Soviet Union, the Soviet's highest honor. A surviving Yak 3 fighter from the Normandie-Niemen Regiment is on display at Le Bourget in France. There is a Yak 3 in flying condition at the Planes of Fame Museum in California sporting Normandie-Niemen colors. To learn more about the story of the Normandie-Niemen Regiment, there's a book by John D. Clarke titled French Eagles, Soviet Heroes: The Normandie-Niemen Squadrons on the Eastern Front that looks rather good. The Normandie-Niemen Squadron name lives on in active squadrons in both the French and Russian Air Forces today. In the French Air Force as the Escadron de chasse 2/30 Normandie-Niemen, flying the Rafale, and in Russian air forces today s the "8-й гвардейский Витебский дважды Краснознаменный ордена Суворова второй степени истребительный полк ВВС России "Нормандия – Неман" of the 11th Air Army flying Mig-29s. Interesting....I had no idea. Thanks. You're welcome, I had no idea about this either and was pretty surprised to come across it.